Are you looking for some career guidance or just confirmation that your current job matches your personality. 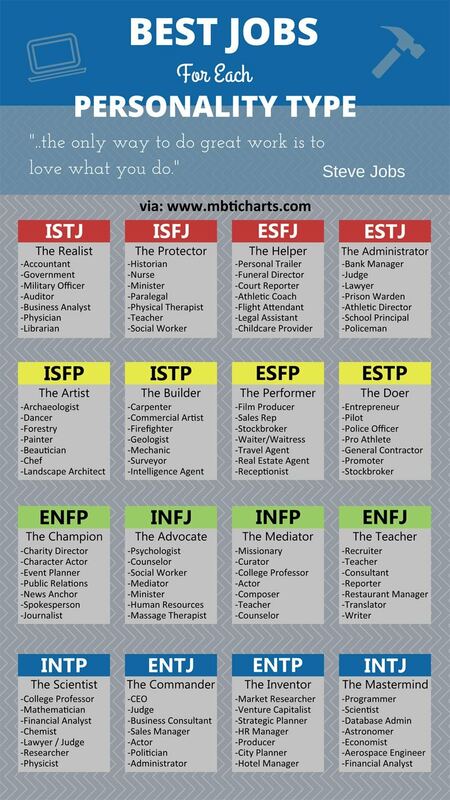 This chart lists a few jobs for each Myers Briggs Personality Type. Of course, any one person can excel at any job they put their mind to. This is also not an inclusive list of all possible jobs that are a good fit for a type. Just use it for fun and informational purposes only. Your Career Doesn’t Match Your Type. Should You Change Jobs? This is very interesting now. Hearing about this Myers Briggs Personality Type thing for the first time. If I have to talk about myself, then I can say I do have a multitude of talents and can see myself doing many jobs successfully in different personality types. For eg., entrepreneur in “The Doer;” composer in “The Mediator;” writer in “The Teacher;” researcher in “The Scientist” and so on. Overall, I prefer a job which involves higher level thinking and creativity. I also wash my housemates things (sometimes), just because I feel like helping them and not because I had a weird fascination with cleaning or something (well, perhaps just a tiny bit). Unfortunately my housemates are not INTJs and I know they will never do the same for me. You should retest every 10 years. Especially if your scores are close. As you do consider truly your actions. Respond in line with your behaviors. Regardless of our desires our actions belie our truths. I am an INFJ and all my life I’ve been told I should have these jobs. I think they are the worst possible choices because INFJ’s attract enough of these people. Instead, INFJ’s should be photographers, trainers, writers, or philosophers. Jobs where they can be helping the world without dealing with people all the time. Love all Meyers Briggs content. I was tested at work about a year or year and half ago. This was definitely a moment of impact for me. The interesting part was my entire inside sales team tested as introverted. I came back a INFJ and the craziest part was the female who gave me the test had also tested INFJ. Like a typical INFJ, I was obsessed and had to learn and know everything Myers Briggs. I would have to say this job would be great for those like myself INFJ who are great listeners because listening to the potential client and their dominant buying motive (DBM) is crucial skill one must develop in sales. In the sales I do it involves helping business owners become more profitable by adding credit cards as a form of payment.